These economical, indoor/outdoor, space saving recycling receptacles are the product of choice for use near walls and partitions anywhere. 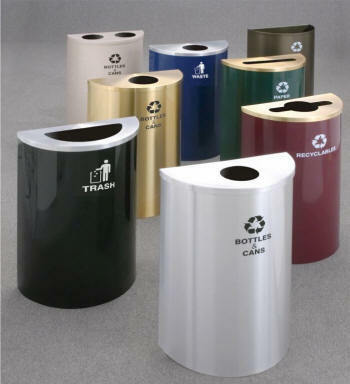 This Value Series of recycling receptacles is identical to the standard Glaro Half Round Series except they offer greater savings because the inner liner can has been eliminated. Instead, Glaro heavy duty 2 mil clear poly liner bags do all the work. They fit over the top edge of the outer receptacle but are not visible because the top cover has been designed with an extra wide lip. Designed and manufactured in the U.S.A. by Glaro craftsmen, these durable, all metal, half round, recycling receptacles feature a full width piano hinged cover for added strength and easy maintenance. All recycling receptacles have rustproof aluminum bottoms. A large selection of easy to clean finishes is available. All recycling receptacle models may be wall mounted with an optional mounting bracket to facilitate time saving, problem free, routine floor maintenance. The optional wall mounting bracket has convenient mounting holes positioned to match standard wall stud spacing.